Getting a new roof is exciting but also cause for apprehension. Many people don’t know what to expect from the process. 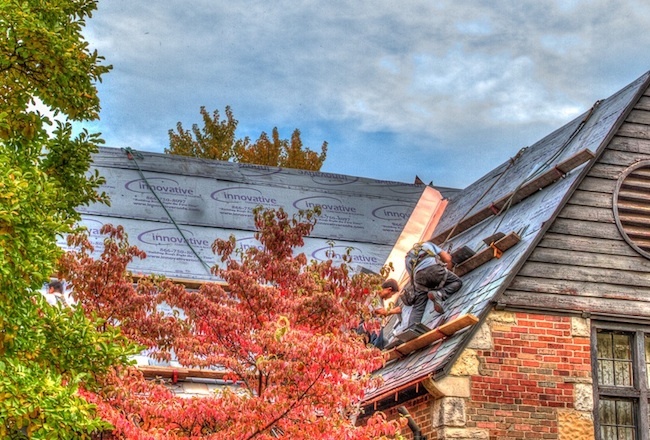 Here is typically what goes on during the roofing construction process. Innovative starts by having a dumpster placed in your driveway. Next, we string tarps from the eaves to the ground to protect your valuable landscaping and prevent stray nails and debris from landing along the home’s foundation. When work actually starts on the roof, expect to be dealing with a lot of noise. Many homeowners choose to get out of the house for the day to avoid the noise. It may sound like elephants are walking on the roof, but we assure you that the noise is completely normal. Once the original roof covering is removed, we make a thorough inspection of the roof decking. Any rotted decking will be removed and replaced with either a half-sheet or whole sheet of plywood. If you did not previously have a ridge vent, you can expect to hear a saw running as the roofers open up the top of the roof for the vent. Once the necessary repairs have been made to the new roof decking, the next step in your roof replacement will be rolling out ice guard along the lower edges of the roof. This protective layer will adhere to the roof to protect the decking in the event of ice dams. Above the ice guard, rolls of synthetic roofing felt will be laid out. You can expect to hear the steady tapping of a nail gun during this process. Flashing and valleys are installed now, along with the chosen shingles. As the shingles are put in place, you can expect to hear not only footsteps but also the steady pounding of a nail gun. This process will be loud. Unfortunately the noise is unavoidable. The final step in the process will be the clean up. The team of roofers will go through the yard with magnets to ensure that all nails and metal debris have been picked up. They will pick up any stray pieces of shingles in the yard. The final step in the process will be removing the dumpster from your property. This usually takes a day or two.